THE UNEMPLOYED EATER: FREE Pizza at New 800 Degrees TONIGHT. FREE Pizza at New 800 Degrees TONIGHT. The fast casual, Ford Model-T-esque quality Neopolitian pizza pie purveying 800 Degrees is opening a new location Monday (1/26/15) in the downtown section of Los Angeles. 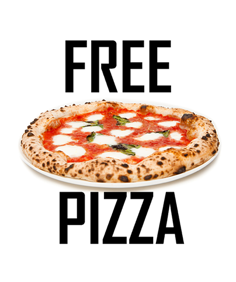 To celebrate the opening and work out the kinks, 800 Degrees plans to give out FREE PIZZAS TONIGHT, FRIDAY, 1/23/15. Up to three toppings. Stop by the 800 Wilshire Blvd. location anytime this eve between 6-9 pm, show on your phone you're a liker/fan/follower of any of their social media accounts and you got yourself a pizza with your name on it that costs exactly $0.00! Also, a cool note: the next local 800 Degrees is coming to Playa Vista. So, uh, Playa Vista, be bumped. Not a 800 Degrees liker/fan/follower yet? That's easy peasy. Go here, or here. Or here. SOSav iPhone Repair of broken iPhone’s. I cracked my screen yesterday and texted him this morning. I had an appointment within minutes and met with him. He showed up on time and fixed everything within ten minutes all while making interesting small talk. He is the best and I definitely recommend him if you need your phone fixed!